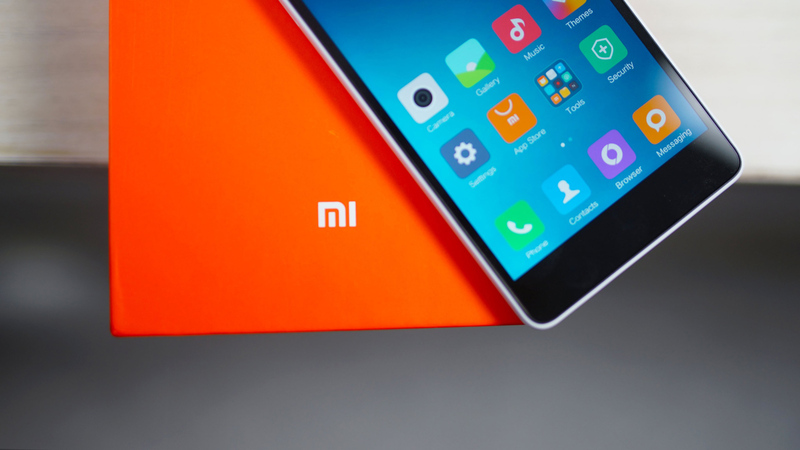 Xiaomi Redmi phones is continuously capturing the mobile market with it's latest flagship. With Redmi 4, Chinese firm have gathered lots of users and again with the Mi4a (best budget phone) makes users to attract towards it. We have seen that Mi 4, Mi 4a and Mi note 4 have successfully gain the users attention and also bond within market. Great features in an affordable cost is really appreciated. On the latest leaks we have received stat that Mi Note 5 will feature a 5.5-inch 1080p IPS display. Under the hood, the Redmi Note 5 is shown to be powered by either a Snapdragon 630 or a Snapdragon 660 chipset, both of which are built on 14nm process. The two mentioned CPUs could mean two variants of the Redmi Note 5. 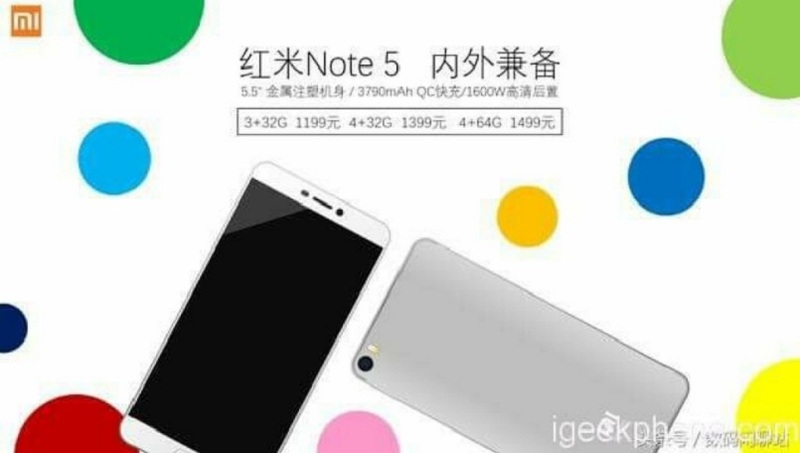 However it is surprising that Mi Note 4 have 4000 mAh battery, but Mi Note 5 will be having 3790 mAh battery. This is pretty good with the expected processor. According to the leak, on the rear, the smartphone will sport a 16-megapixel camera, a 13-megapixel sensor on the front. 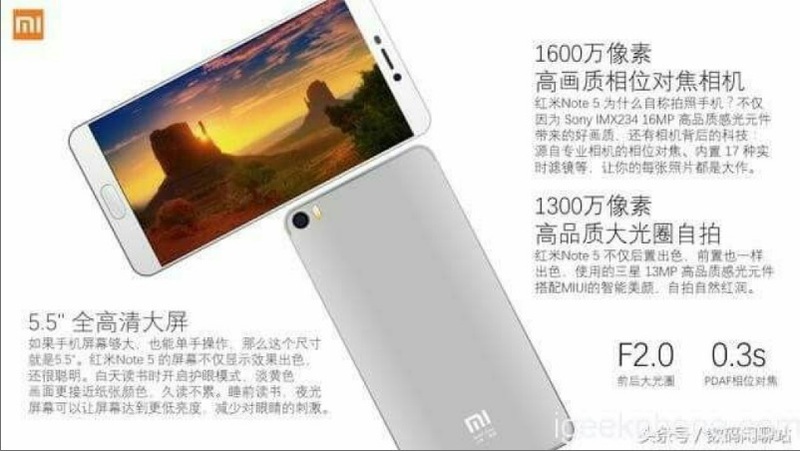 If true, that would be a dramatic increment from Redmi Note 4’s 13-megapixel rear and 5-megapixel front camera. Now regarding the price, it will depends on the variants. 3GB RAM and 32GB ROM prices at CNY 1,200, which is about Rs 11,400. 4GB RAM, 32GB ROM prices at CNY 1400 which is about RS 13,000, and 4GB RAM- 64GB ROM prices at 1,500 CNY is approx to Rs15,000. Leaks also stay tha Mi Note 5 will be running on Android Nougat 7.0 having MiUi 9. MIUI 9.0 is not yet announced but Mi Note 5 may the first device to come up with it.